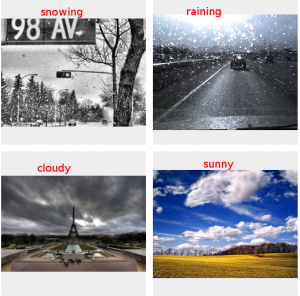 One week later I am proud to announce that our weather lesson is both more attractive and much more effective thanks to some great collaboration by our users. 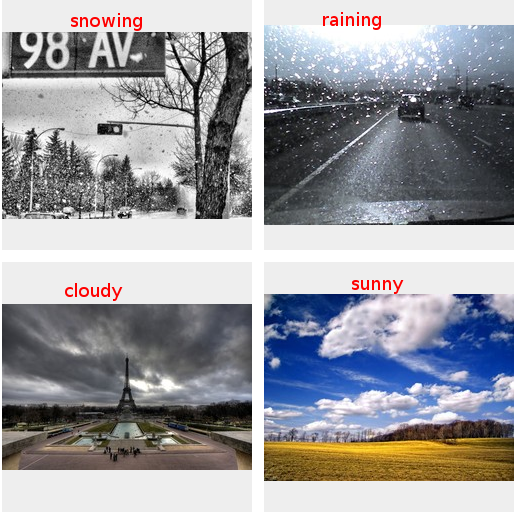 You can see that the new pictures are much easier to tell apart, especially the raining and snowing ones. In addition, the sun is now clearly visible in the “sunny” picture and there is no Eiffel tower in the “cloudy” picture to cause confusion about subject. It was great to collaborate with some other users on this lesson, try out our tools for working together on a single lesson, and all the other things this push was designed to accomplish, but the best part for me was seeing how the structure of the lesson helped to keep us honest and keep our work useful. 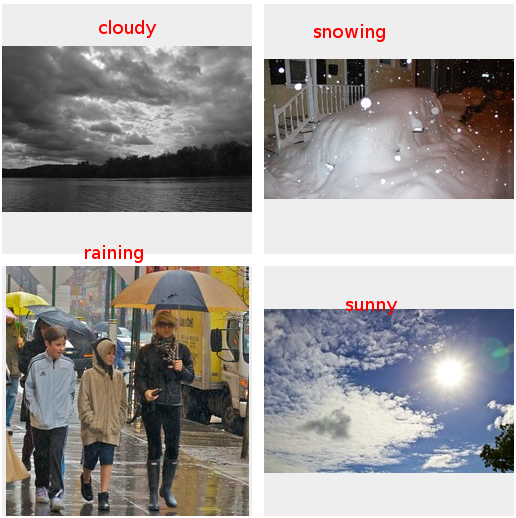 The original weather lesson contained three types of vocabulary: words to talk about light (cloudy/sunny), words to talk about precipitation (raining/snowing), and words to talk about temperatures (hot/cold/cool/warm). 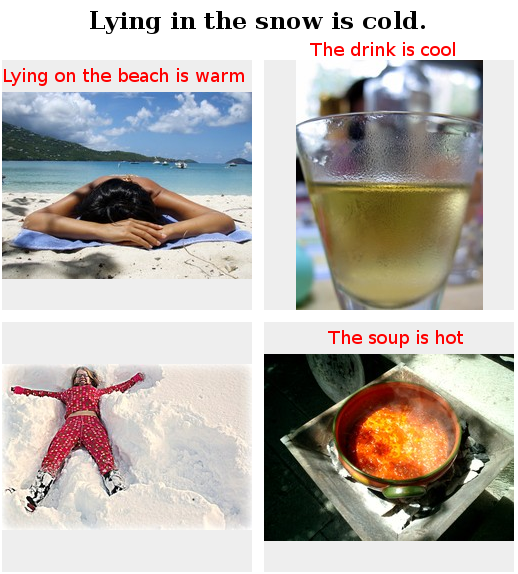 As we all tried to find better pictures for the lesson, it became clear that this last group, the temperature words, was giving everyone trouble. 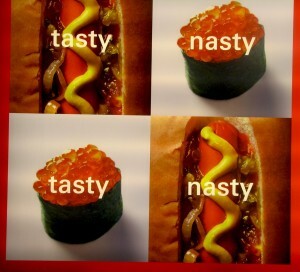 The problem was simple, we fell into the native speaker trap of trying to combine too many concepts in a single lesson. Temperature is much more easily illustrated as a property of things, like foods or beverages, rather than by pointing a camera outside and trying to capture the essence of “cold”. When we tried that, we all came up with different representations, some were animals in the sun, some were people outside surrounded by fall foliage. Instead of depending on these personal cues, we broke temperature out into a separate “Temperature lesson and moved combined all of the best weather pictures into a Best of Weather lesson. The result is much more grounded and easy to incorporate into other lessons through shared vocabulary. It is all too easy when trying to teach someone material that you know very well, like your native language, to gloss over the complexity underneath and forget just how much information there is to share. Breaking that material apart and illustrating it are great ways to keep your lessons useful to those who are coming at them with fresh eyes. If you are interested in trying such a system, give wikiotics a try. Special thanks to jchan, Qalthos, stevensne, colannino, and trose, for building their own versions of the lesson and making the collaboration possible. The collaboration with RIT’s FOSS@RIT campaign I blogged about last week is now the subject of a press relase from the school here or archived here. Currently we’re at the top of the University homepage! Welcome to all the RIT students who have found Wikiotics through that release. Thanks to the FOSS@RIT program, Wikiotics is proud to welcome two new developers to the project, Taylor Rose and Nate Case . Both are students at the Rochester Institute of Technology and veterans of the FOSS@RIT program. FOSS@RIT houses an innovative introductory class “Humanitarian Free and Open Source Software Development” designed to give students real experience with free software all the way from the principles of copyleft through the communication and development tools used to build systems like Wikiotics in a global community. You may have seen some of their projects before, like the video chat client for the deaf that landed on BoingBoing back in June. Once students complete the class they are eligible for independent studies, campus jobs, co-ops and Summer Undergraduate Research Fellowships. The goal is to partner with interesting mentoring organizations where their development talents can help solve real world problems, which is where we come in. Regular Drumbeat users may recognize Taylor from our comments page. In fact our Drumbeat project launch is what brought Wikiotics to the attention of Taylor, Nate, and the folks behind FOSS@RIT, spurring this collaboration into existence.